In this video and article we’ll share eight great ideas to help you garden more sustainably, in step with nature. Let’s start by replacing electric or gasoline-powered equipment such as lawnmowers, tillers and leaf-blowers with more sustainable human-powered alternatives whenever we can. It’ll save natural resources, and by breaking big jobs down into regular smaller blocks, it’s a great way to stay active and keep fit. Trees lock up carbon dioxide from the atmosphere, helping to mitigate the effects of our changing climate. Let’s plant more of them! Trees range from tiny to massive to suit every space, and can be planted into otherwise wasted or underused parts of the garden. Most are easy to grow and many trees are productive too – just think of a handsome apple tree, for example. Trees offer birds somewhere to nest, feed and shelter. In return they will keep many plant pests in check while contributing their melodious song. Lawns demand a lot of effort and watering to stay green, especially in hotter climates. How much lawn do you really need? Can any of it be repurposed? For example, a native wildflower meadow only needs mowing once or twice a year. Make the lawn that remains more sustainable by simply leaving the grass to grow a little longer between cuts. Then leave the clippings where they fall at least once a month to return their nutrients to the soil. Opt for lower energy, natural materials in the garden – from biodegradable pots made of coir, cardboard or even old newspaper, to a greenhouse built from sustainable wood in place of aluminium. Many gardeners are only too happy to repurpose old items into new ones for the garden. And there’s all sorts of fun to be had in getting creative! Nature gives us lots for free. Set up barrels to collect rainfall and cut your consumption of treated water – and your water bill! 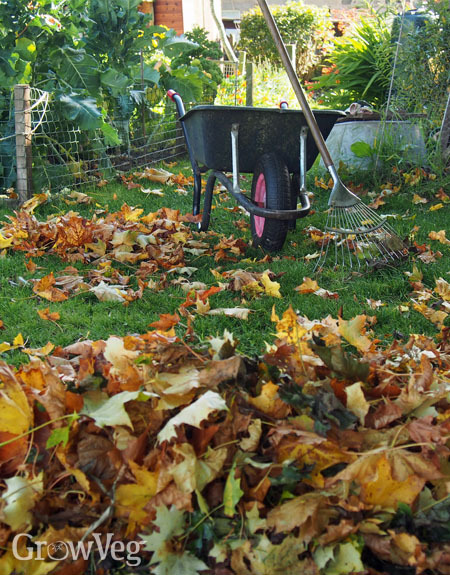 Rake up fallen leaves to make leaf mold – the perfect material for improving soil structure or creating your own, packaging-free potting mix. Create more spaces for wildlife. Flowers rich in nectar feed pollinators, as well as drawing in other insects to feed on the bugs you don’t want. Include a pond for frogs and toads – the ultimate slug controllers! Extra room for wildlife doesn’t mean sacrificing valuable ground space. For example, install a green roof on your shed or put together a simple bug hotel. Projects like this are great fun for adults and kids alike. Many projects are easily completed in a weekend to bring benefits lasting long into the future. Not sure? Then use the fully searchable Garden Plans Gallery on this website to see what others are growing in your area and seek some inspiration. Or step in and explore our Garden Planner for yourself. It’s easy to narrow down the selection of plants to, for example, those that will happily grow in partial shade or are frost tolerant. And because the software knows your location, you can even filter the list to show only those plants suitable for sowing, planting or harvesting during a specific month in your location. Simple! Don’t be in too much of a hurry at the start of the growing season. Work back from the last frost date so tender crops like squashes aren’t sown too early and are ready to plant when the time’s right. This will also minimize the need for costly heating. Our Garden Planner includes a handy Plant List to help with this too! Of course, growing any fruits, vegetables or herbs is a big step towards a more Earth-friendly lifestyle, so grow as much as you can: plan ahead, re-sow throughout the growing season and set aside some of your homegrown bounty for the leaner times of the year. You’ll be doing yourself and the planet a world of good.